First of all, no mum does not DRIVE a racy car. She just tells people where to go.... And she does it very well. HAHAHAHAHAHA. 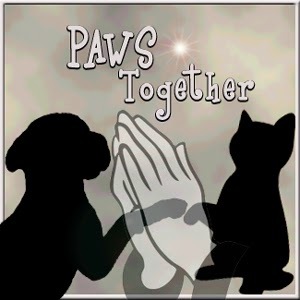 Purrs and prayers to all who have been or may be affected by all the nasty storms. It is scary to have sirens, and boomers and nasty winds going on. You all be safe now! 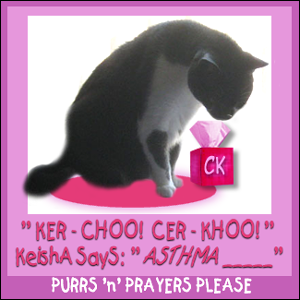 More purrs and prayer for Keisha. She has asthma, and that is not fun. Plus Derby Day is coming on Caturday. Party will be held as usual. Well, we won't be talking to mum for a bit. Did she stay home and play and nap with us? NO! She went off to play with racy cars. She was a bit farther south and so spring has been a bit longer there. She found the first dandy-lion and things here are a bit greener. Here is some of the gang hanging about, resting a bit. It wasn't that warm, but a bit breezy. No rain during the day. One car got way off and then was all muddy and came in on the hook. Trout Towne Tabbies would like this race car, it has a fishy on it. We on the other hand we were home. Just hanging out. Mum came home from day hunting yesterday and heaved a big sign of relief. Guess she got through working without her normal partner in crime this past week. So that is why she came home a bit later than normal all days this past week. This is what we will be doing this weekend. Playing and snoozing. Have a grate weekend everyone. 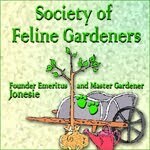 Hello and welcome to Garden Thursday with Me, Virginger. I had lots of snoopervising to do this past weekend and I did it on my own. Those mancats were off napping! No mancats hanging out in the window, just me and mum outside and working! First she assembled her little cart for toting things around the yard. Big enough for what she needs and it is small enuf to store in the metal monster room without taking up a huge space. Then she starting digging away the dirt from near the front faucet. We have that big round stone slab and mum wanted it to sit even with or just below the porch slab. Dig she did, put down weed barrier, put the round stone down and then added lots of little rocks. Those bags are heavy so that little carry thing came in handy. Front all done and it the hose leaks, then the rocks get wet, but no mud to make a mess. The off to the back to do that one, but mum says she ran out of rocks and will need a couple more bags. But enuf done to move the hose back, the extra rock will go in front. Then we finally have flowers and lots of them! This first one is in the back and the first daff to open in the back yard. Then in the front, lots of daffs plus the crocus are still blooming. The little yellow things look like daffs but they are only a few inches high, so really tiny daffs! Here is the biggest clump of daffs in the front. Mum isn't sure if these are old ones that didn't get dug up, or if they are new ones she planted. Plus the four-sith-ia is finally starting to bloom. Now mum says she really thinks it is spring once this plant blooms. Bizzy week here, more to do in the next week. See you then. Love, Virginger. 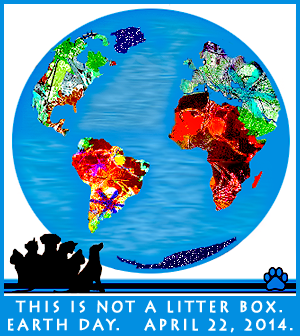 We want to wish Ma Earth a good day. We try to treat you right, but we know we can improve. Stay well and healthy for us. We hopes everyone had a marvelous Easter weekend. We did, as on Sunday we got a super treat. See how warms it got?! Mum opened all sorts ot windows, including the big windows that go to the floor! They were open all afternoon. We enjoyed it so much and so did mum. Smelling all the fresh airs, listening to fevvers singing like crazy. They are out and looking for love! Soon we will have baby fevvers. Well, mum says she has work to do, but sure isn't getting going on it today. Says she has to get motivated. Wonder what store sells that! She did get enough motivated to put out the hummer feeder this morning. She made up the sugar water last night and has a good supply to start the season. Mum told us we need to watch now for the hummers to show up. It will be soon. So Derby took over part of the tower. I sat on the table for a bit, then move into the little house on the tower to watch. Plus I love to smell mum's jacket when she has been outside. All sorts of neat smells. Happy Caturday, Happy Easter Eve and all. Mum says she has found a bit of motivation, so guess she will go do her chores. Welcome my friends to the winter that never ends! Yes, we got a little bit of snow this past week. The top picture is from the back on Monday evening. These next three are from Tuesday AM. You can just see my back sitting down below the fake gull! Yes it was cold out, but I am a hardy squillion who can take the cold. But at least it wasn't cold enough to snow over the weekend when we got nearly 3 inches of rain! Man, if that had been snow, we probably still wouldn't be shoveled out! Like the boys showed on Caturday, we do have a few flowers. The older crocus are pushing up and blooming in the front bed through the old leaves. But here are a few new ones that mum planted, these are yellow. Mum even thinks some of our bulbs didn't get dug up with the destruction last fall, so some old and new daffs and tulips are up but not yet bloomed. Ducky being my buddy and helping to snoopervise from inside. Love ya dude! That is it for this week, see you soon. Love, Virginger. Well, while mum was off gallivanting to the gonad place last week, we did get two awards from our blogging pals. 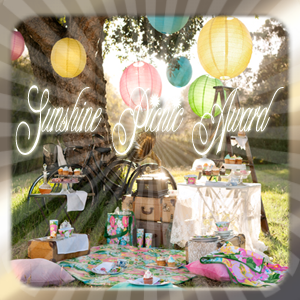 From The Poupounette, The Sunshine Picnic Award comes with an invitation to a picnic where each brings something to eat. Well, something local that we could bring to a pic-a-nic! Hmmm, lots of what we have lot of German heritage in this area. So we will bring some fun sausages. Bratwurst, yachtwurst, mortadella, knachtwurst. Mum is drooling as she types this for us! Now who to invite for the next pic-a-nic. We too want a variety of good stuff from other place. But we will stick to the good old USA! South Carolina - Truffle and Brulee, who by just their names are delish. Then from Nissy, the YOO-HOO Award! Thank you so much Nissy. We love to YOO-HOO or Yipee or whatever you want to say when you are happy. The YOO-HOO! Award which, as you know, is one of Nissy's favourite sayings. It's a saying just made for celebratin' and that's exactly what we're gonna do today. The rules for acceptin' the Yoo-hoo! YOO-HOO! Award are pretty simple. - Firstly, post the award on your blog and thank the blogger who gave it to you. 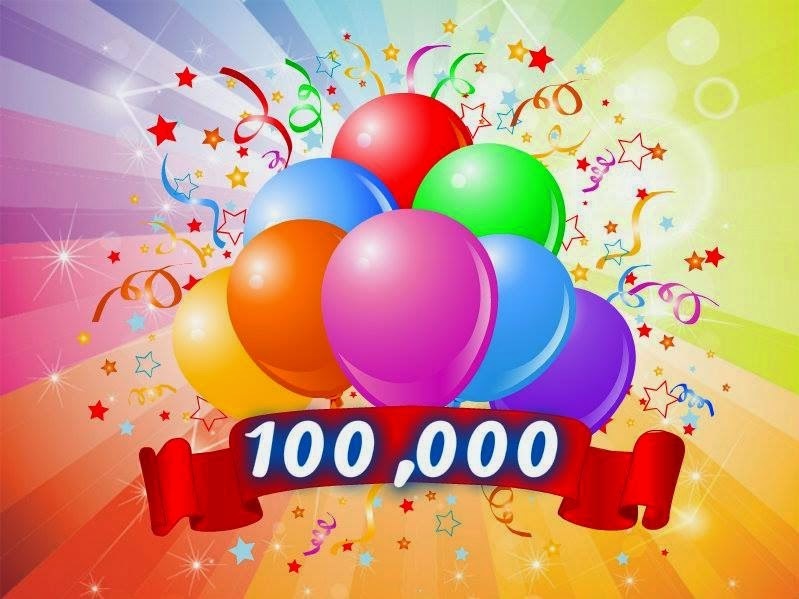 - Lastly, pass along the award to seven other bloggers and let them know you have done so. We visited some of the other award winners. Having a great home and mum. It is finally spring, although the bit of snow the past day or so isn't welcome! Seven other bloggers to pass it along to.